Every knows how they begin. That black screen with the blue lettering saying “A long time ago in a galaxy far, far away” and then cue the music, logo and the infamous title crawl. Yes, I’m talking about the one and only Star Wars movie saga. For generations, Star Wars (created and directed by George Lucas) has taken millions of viewers (both young and old) on an epic space opera adventure, filled with aliens, space pirates, jedi, lightsabers, stormtroopers, droids, and, of course, the mystical omnipresent lifestream known as “The Force”. Uniquely enough, the Star Wars films (six in total) has been spilt by a generation gap. Star Wars Episode IV, V, and VI (1977’s A New Hope, 1980’s The Empire Strikes Back, and 1983’s Return of the Jedi) debuted first (dubbed as the “original” saga, while Star Wars Episode I, II, and III (1999’s The Phantom Menace, 2002’s Attack of the Clones, and 2005’s Revenge of the Sith) debuted later (dubbed as the “prequel” saga). Whether you prefer the “original” or “prequel” Star Wars saga (and it has been debated over the years), the success of the six movies has been astronomical, grossing over 4.38 billion as a film franchise, making Star Wars the fifth highest grossing franchise ever. Even the Star Wars brand has greatly expanded beyond the realm of the six episode movies. This includes toys, action figures, clothing apparel, home decorum, video games, novelty items, cartoon spinoffs, and even a 1978 TV Christmas special. Now, with the recent acquisition of the legendary franchise, Disney and director JJ Abrams proudly announce the seventh episode installment in the illustrious movie saga with the highly anticipated film Star Wars: The Force Awakens. Does the movie truly awaken (with a new and engaging continuing saga to tell) or is it just a flashy sci-fi reboot that’s desperately trying to “cash in” on the brand’s prolithic film legacy? Thirty-two years have since the events of Return of the Jedi and the galaxy is still at war. The ruthless Emperor Palpatine is dead, along with Darth Vader, his right handed Sith warrior, as, the remnants of the oppressive Empire have regrouped and formed the First Order. Led by Supreme Snoke (Andy Serkis), this organization has new Stormtrooper recruits, a new superweapon, and a new ruthless Sith warrior named Kylo Ren (Adam Driver). 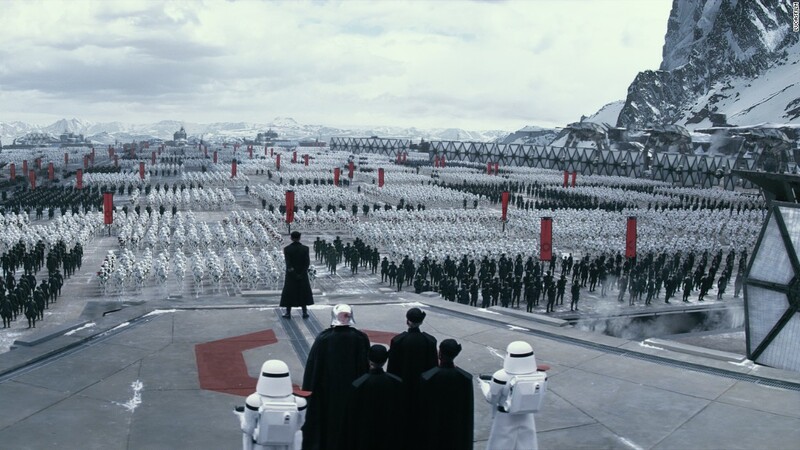 The First Order faces off against the Resistance, formerly known as the Rebels, who are now led by General Leia (Carrie Fisher) and band of familiar heroes. Unfortunately, in the intervening years, Jedi war-hero Luke Skywalker (Mark Hamill) has all but vanished. Now, in a desperate position, Leia attempts to find Luke to help them again, sending off her top pilot Poe Dameron (Oscar Isaac) on a to find a vital clue on Skywalker’s whereabouts, eventually crossing paths with Finn (John Boyega), a Stormtrooper with a newfound conscience. 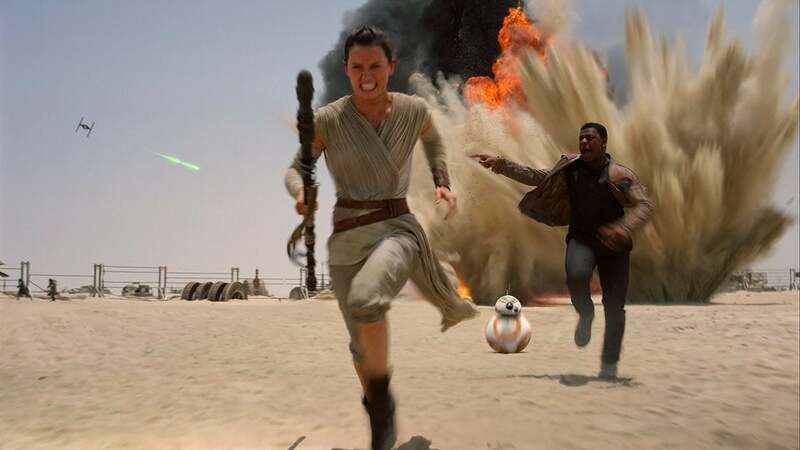 Crash landing on the desert planet Jakku, Finn meets Rey (Daisy Ridley), a desert scavenger longing to find her place in the vast galaxy, who is in possession of Poe’s BB-8 Droid, who, in turn, carries the secretive location of Skywalker. The pair soon are swept up in thick of battle, crossing paths with old war heroes (you can guess who) and evading Kylo Ren and his Stormtroopers as they make their way to return BB-8 to the Resistance’s base. What can I say about Star Wars movies? I absolutely love them. Everyone says that Episode V: The Empire Strikes Back is their favorite Star Wars movie. Mine is actually Episode VI: Return of the Jedi. It was the first Star Wars movie I actually watched (I think I was 8 or 9 years old) and I completely love the movie (from start to finish). As for my stance on which trilogy is better (the prequel or the original), I like both. Each episode film has their own merits and faults in their presentation. Certain things I like in the original trilogy, while somethings I like in the prequel trilogy. Thus, I embrace them both wholeheartedly. After watching Episode III: Revenge of the Sith, I felt that movie franchise was complete and that the Star Wars brand would continue on through its other various media outlets. Of course, that I changed when control of Star Wars universe switched from George Lucas to Disney and the announcement of Star Wars: Episode VII shortly after the acquisition. Like many, I was skeptical about this new movie, believing that Disney would “Disneyfy” a new entry in a much publicly beloved film franchise. Now, after seeing the movie, I personally dis-regard my previous doubts as The Force Awakens captures the fun and exciting spirt of Star Wars, acting as both continuation and new entry point for viewers into this science fiction universe. With The Force Awakens, the seventh installment in the series, we finally see the long running franchise move past the creative control of George Lucas and landing the hands of Disney and reboot Star Trek movies (2009’s Star Trek and 2012’s Star Trek Into Darkness) director J.J. Abrams, who face the titular task of delivering new (but familiar) Star Wars feature that’s meant to please old fans as well as an entire new generation. With that monumental challenge daunting him, Abrams does manage to meet most of those challenges with The Force Awakens, providing moviegoers with an entertaining and adventurously fun new Star Wars film. There were many concerned that Abrams wouldn’t fit the mold to do a Star Wars film (fearing that he would try to assimilate a likeness from his two recent Star Trek movies into Episode VII). Trust me when I say this that you need not worry about that outcome. Abrams certainly separates his past involvement in the Star Trek universe when stepping into the Star Wars universe. In truth, Abrams plays to the aesthetic of original trilogy in directing The Force Awakens, giving the feature (in its entirety) an authentic feel that makes Episode VII feel like a worthy successor to Episode VI in both filmmaking realism and in its sequential storytelling narration. To me, Abrams does a good job of steering The Force Awakens away from the heavy usage of CGI visuals and aesthetics that were used in the prequel trilogy and (instead) leans more towards how the original trilogy was made with more practical usage of costumes, props, and real-life locales. Even the production designs, which was inspired by Ralph McQuarrie (the original Star Wars artist), feels genuine and helps reestablish the overall familiarity of the Star Wars Universe all over again. That’s not to say that Abrams doesn’t utilizes the advances of moviemaking when crafting The Force Awakens; sleek CG visuals are still used (but not over saturated) and updating various things to make the classic Star Wars monikers and tropes fun for the eyes to rediscover (i.e. seeing the Millennium Falcon, X-Wings, TIE Fighters, Stormtroopers, and various other alien species in the background of shots is definitely a hoot to see). In short, Abrams and his team create a new Star Wars movie that will please older fans and also new ones, while also taking a more restrained approach in the overindulgence of CGI visuals that Lucas permeated throughout the prequel episodes. However, even this new Star Wars film, can’t escape of being unscathed from its flawed devices. It’s clear from the get-go that Abrams and (more to the point) Disney approach The Force Awakens as a first chapter in a new trilogy saga. Like a lot of recent cinematic universes out there (most notable Marvel’s MCU), the old narration of storytelling in a standalone feature is being stretched and completed throughout sequels and spinoffs. Thus, the screenplay, penned by Abrams and Lawrence Kasdan (who wrote the script for The Empire Strikes Back and Return of the Jedi), leaves much to be desired; resulting in most moviegoers seeking for more answers than “actual” finding answers when leaving The Force Awakens. Undoubtedly, the story in The Force Awakens (whether on-stage or off-stage) has room to expand its narration; presumably in various (in future forecasted) projects (i.e. books, comics, games, TV shows, movies, etc.). Truthfully, I kind of half-expected this to happen, especially coming from Disney who will definitely capitalize on the Star Wars brand. While that doesn’t bother me as much, I do feel like The Force Awakens (as a whole) is, more or less, a somewhat retread through Episode IV: A New Hope. I wouldn’t spoil for my readers, but, if you draw the comparison between the two, both are almost identical in their cinematic telling. Again, it doesn’t hurt the overall enjoyment of the film, although it’s sort of a slight letdown as I was expecting something a little more refreshing to The Force Awakens rather than paralleled illusion to A New Hope. In terms of acting and performances, the cast for The Force Awakens is solid and are picked well for this sci-fi adventure, though some roles are underutilized. Daisy Ridley’s Rey is, of course, is the big role in the movie and she does the excellent job, bringing with her plenty of wit, charm and gravitas that helps legitimatize herself (and her character) as a strong female lead not just for this movie, but presumably for the rest of this new trilogy. Close behind Ridley’s Rey is John Boyega’s Finn, who acts as a great character foil for Rey. Boyega nails the proper balance of comedic charm and heroic bravado that made the character of Hans Solo so impactful in A New Hope and also in the sequential episodic features, including having some great chemistry / banters with his leading female counterpart. Speaking of Solo, Harrison Ford returns to one of his most famous role as the gunslinger smuggler and truly Ford has not lost his touch, bring back all the iconic swagger and smarmy charisma found in Hans Solo (as if no time has passed for the seasoned actor in return to a role that he hasn’t played in decades). Even his on-screen chemistry Boyega’s Finn is great (providing to be some of the funniest moments in the movie) as well as verbal exchanges with Peter Mayhew’s Chewbacca or Carrie Fisher’s Leia. Oscar Isaac’s Poe Dameron, while giving a good performance as the hotshot X-Wing pilot, is probably the character that gets short changed of all heroes in The Force Awakens (most likely he’ll get a bigger role in the upcoming features). There also some familiar faces (and droids) in the movie that many Star Wars fans will recognize and have smile on their faces when they appear on-screen. Lastly, the little BB-8 droid (theR2-D2 of this new trilogy) is absolutely adorable and funny at the same time. As for the main villain in The Force Awakens. Adam Driver does a pretty good performance as the villainous Darth Vader-like enforcer Kylo Ren. He definitely a worthy successor to the iconic Darth Vader from the previous installments, while, at the same time, still manages to be distinctly different in defining his role of villainy. Although, I have to admit that Driver’s Kylo Ren looks more menacing with his mask on rather than off (just my opinion). The other villains in The Force Awakens that basically make up the important roles in First Order, are underserved. This includes Gwendoline Christie’s Captain Phasma, Domhnall Gleeson’s General Hux and Andy Serkis’ Supreme Leader Snoke. Again, like Isaac’s Poe, all give good performances, but aren’t completely flesh out in the movie and will (presumably) be detailed out more in the future installments. Lastly, legendary music composer John Williams returns the Star War universe to score The Force Awakens. All the classic sweeps, melodies, and themes are sprinkled throughout the feature and really does bring with it a lot of nostalgia. Just hearing the opening Star Wars theme song will send chills down your spine as a rush of old memories of watching the previous movies will wash over you. The only downside is that William’s score for The Force Awakens doesn’t have a signature song that defines the movie (i.e. “The Imperial March” from The Empire Strikes Back or “Duel of the Fates” from Phantom Menace or even “Across the Stars” from Attack of the Clones). Is The Force Awakens worth the hype? Yes. Did it match my geeky fanboy expectations? Yes. Is it worth seeing again. Absolutely. J.J. Abrams succeeds greatly in The Force Awakens, acting as a grandiose “welcome back” blockbuster to the beloved franchise that will surely please fans and newcomers alike. While there is a sense of déjà vu and certain aspects aren’t as flesh out as they could be, the movie is entertainingly fun, excitingly thrilling and unequivocally filled with nostalgia. To me, it was exhilarating to return to the cinematic universe of Star Wars and to catch up with some old and new faces. I highly recommend everyone to see this movie in theaters. Now I can’t hardly wait to see where Star Wars: Episode VIII (due out 2017) will take these characters (and the franchise) to next. 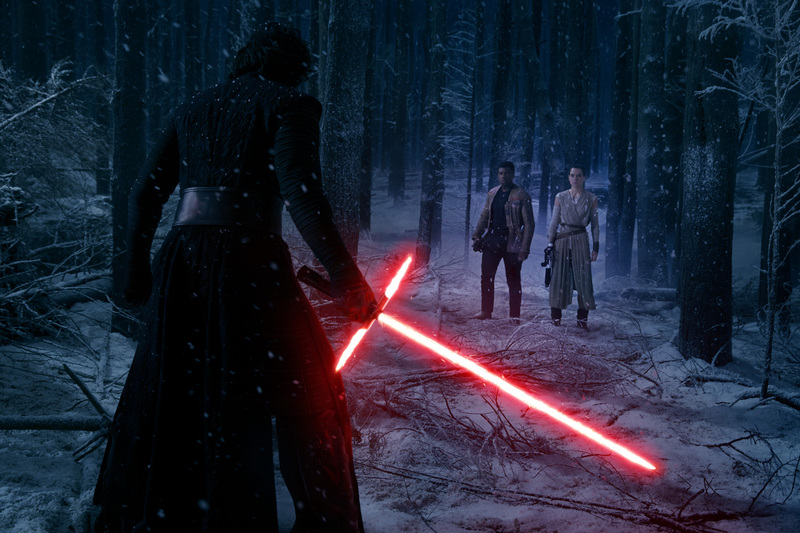 Bottom line, The Force Awakens is pure movie escapism at its best. Plain and simple. Just in a galaxy far, far away. Great review Jason. It’s time for us to get excited about Star Wars again. How are you feeling about Rogue One? I’m stoked to see Rogue One. Definitely going to be interesting. Thanks for the comment! I hope it succeeds. If it fails, the Star Wars universe becomes a much smaller place. As far as the future of the saga is concerned, this is a big movie.